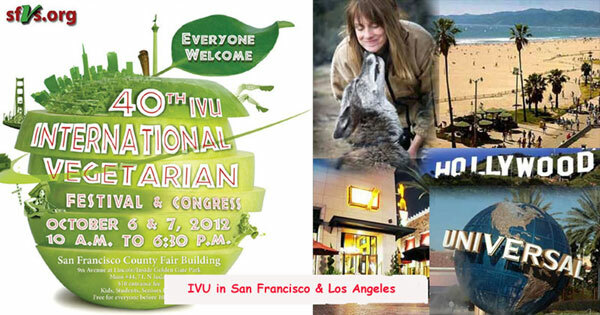 The first ever IVU World Congress/Vegfest to be held on the West Coast of North America is about to begin. We start in San Francisco from Friday, October 5, then down to Los Angeles for October 11-14. This will be the 40th such event held all around the world in 104 years, since 1908. Up to a couple of years ago it would be fair to say that most veg*ns in California had never heard of IVU. No doubt some will still miss our arrival, but the publicity will already have helped to raise awareness among many there. 1 – to help local veg*ns in their efforts to promote our way of life, by generating some publicity and increasing the noise level. A bunch of foreigners arriving in town can often attract interest in the local media. 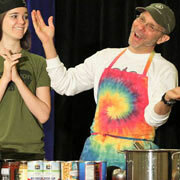 2 – to make North Americans generally more aware of what is happening in the veg movement around the rest of the world. There will be speakers from all over the world in both San Francisco and Los Angeles, and we’ll be looking to put lots of reports online so that that unable to attend will still get to know something about them. Note: the word ‘vegetarian’ refers to food ‘with or without’ eggs/dairy - *everything* below is the ‘without either’ version…! - i.e. suitable for vegans. Thursday, October 4 – drive down to London for a direct flight to San Francisco, pick up a rental car and drive over the Golden Gate Bridge to stay with our Vegsource senior friends near San Rafael in Marin County. Friday 5 – a lazy jet-lag morning, then down to the city for a stroll around Chinatown, before heading to the world-class Millennium vegan restaurant for the evening registration and dinner with our global friends. Thanks to Green Earth Travel for helping to get them there – I’ll be on the door with Marly and Hazel to welcome everyone. Saturday 6 – to the Golden Gate Park for the San Francisco VegSoc’s annual veg festival – www.worldvegfestival.com - this year with IVU members and supporters on the program, joining more than 6,000 locals that went along for all the fun last year. The Green Lifestyle Film Festival is also moving up from LA for the weekend this year. About midday I’ll be giving a presentation IVU and veg*ism around the world, along with colleagues from the IVU International Council. There will be a lot of people around that I’ve talked to online for years, but this will be the first opportunity to meet many of them in person, so it will be a great weekend. There will also be some time out to take a look around the park and the botanical gardens next door – and a wander over to the Bluegrass Festival that Hazel found online. Hopefully we can persuade some of the music fans to drop into the Vegfest too. Sunday 7 – day two in the park, with a huge variety of activities. I’ll be giving a brief talk on vegan history in the evening, as a warm-up act for John Robbins, the famous author of the multi-million selling Diet for a New America, and the founder of Earthsave International. He is just one of many great speakers over the two days. Monday 8 – a slow morning planned... In the afternoon it’s back down to the city for a rooftop reception at the office of VegNews magazine. Then maybe over to the Loving Hut vegan restaurant in the evening, where GoVegan Radio will be hosting a dinner for the SFVS volunteers. Tuesday 9 / Wednesday 10 – Hazel and I will be taking the small coastal road down to LA, taking in the scenery and stopping a night in San Simeon, along the way. Then arriving in LA to stay with our friends Zel and Reuben who run the Vegetarians in Paradise website - and produce some great vegan cookbooks. Thursday 11 – the bus tour around LA. There is nothing quite like a bus full of people from many different countries. We’ll be meeting some rescued wolves, dropping into the Getty Museum, Venice Beach, Hollywood and Universal Studios – and eating at some outstanding vegan restaurants along the way. Friday 12 – the IVU International Seminar – deliberately smaller than the many thousands we’re expecting in SF. This will be an opportunity to interact with speakers from all over the world, on a wide variety of topics. I’ll be leading the opening presentation, with a panel of IVU speakers, and keeping an eye on things thru the day. Saturday 13 – up early as I’m on first at 8.30am, kicking off the Expo on the beginnings of veganism. Then I can sit back and listen to some of the top American experts in veg health and nutrition. In the evening we’re over to a nearby high school for a (vegan) fundraising comedy pro-celebrity basketball match - PCRM Food Fighters vs Harlem Wizards. Sunday 14 – day two of the Expo, more great presentations expected - Jeff Novick MS RD. (right); Michael Klaper, MD ; Neal Barnard, MD ; Caldwell Esselstyn MD ; John McDougall, MD ; Brenda Davis, RD ; John Robbins and more amazing fun and serious speakers over the weekend. Monday 15 – to LAX in the afternoon, arriving back in London on Tuesday morning, and a leisurely drive home to the cold damp English countryside. We’re looking forward to a great experience, and a lot of fun in the sun.